Cut or tear tortillas into pieces. I usually cut mine into triangles. In a large frying pan over a medium flame, add oil and allow to get hot. Add tortilla pieces and fry until crisp, about 5 minutes. You want the tortillas to be as crisp as chips. Remove tortilla chips from oil and drain on a plate lined with paper towels. Remove most of the remaining oil from the pan, leaving about 1/2 teaspoon in it. Sauté onions in the oil and cook for about 3 minutes. Add in tortilla chips and mix to combine. In a small bowl, whisk eggs and then pour them over the chips. Mix to combine, and cook until all eggs are cooked to your taste. I cook mine for about 5 to 6 minutes, mixing often. You can add any vegetable to this dish to make it heartier. You can serve this recipe with a side of beans. My grandfather and my family are from Chihuahua, Mexico. They eventually moved to the city of El Paso, Texas, as many people did during the early 1930s. I love hearing the wild stories of his childhood; how they earned money and what they did for entertainment. Mostly, though, I like to hear about what they ate. They were very poor so they had to get very creative with what they had. A lot of times, my grandmother would mix American ingredients and traditional Mexican foods. This melding of culinary cultures is part of what is now called Tex-Mex food, and my grandfather is an expert at preparing it. One of my favorite Tex-Mex foods is the well-known dish, migas. It resembles chilaquiles, except migas are kid-friendly because they don't have any chiles. It’s very easy to prepare: scrambled eggs, mixed with strips of tortillas, diced onions, and lots of cheese. I bet at the time they had no idea they were making a gluten-free dish as well! 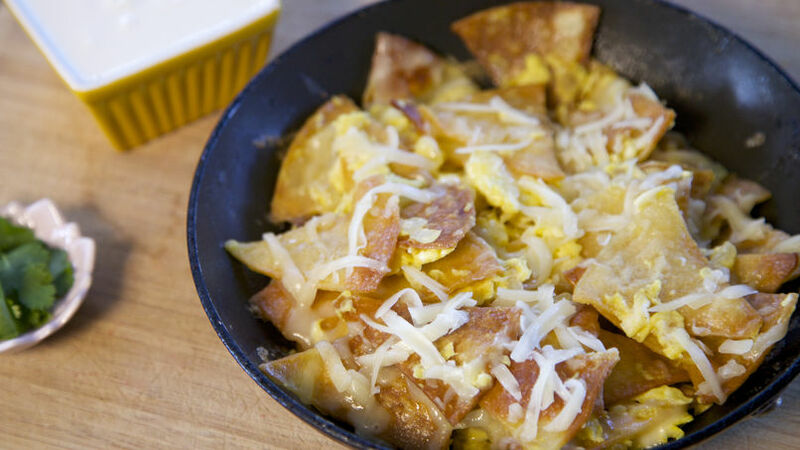 There are different ways to prepare migas, depending on the country. In Mexico City, migas are basically a soup. Migas from Spain, however, are served as tapas and are made mainly of bread and served as a side-dish for pork ribs. Give this Tex-Mex recipe a try!